I tell them that what they are seeing are American Robins, not the exact same birds they had nesting in their yards in the summer, but robins from further north, most likely Canada. So, what do robins eat when the ground has frozen shut and snow covered their access to earthworms? We appear to have a bumper crop of fruit on the hackberry trees in my neighborhood. The large flocks of robins jockey for position on the thin branches while fighting off American Crows, Eupropean Starlings and Rock Pigeons for access to the food source. 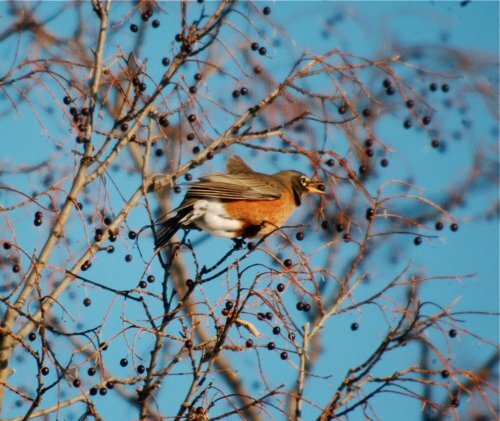 According to Cornell’s Birds of North America Online robins also rely on English Hawthorn and Juniper berries to make it through the winter. I suspect some of our most hated invasive plants like Buckthorn and Honeysuckle figure in to that strategy in a big way as well. Sometimes robins get creative and adapt to different food sources. Last winter, JJ Golden emailed me a photo of a robin that was going for small fish in a Minneapolis city park. I’ve seen robins hang around Twin Cities bait shops in winter, foraging on dead minnows tossed outside, but I had never seen on actively fishing. The North Wind doth blow and we shall have snow and what will Poor Robin do then? Poor Thing! 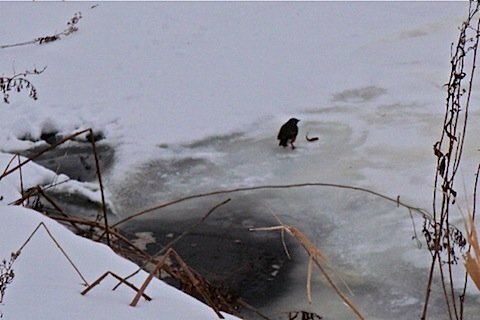 They go out into the trees, gorge on hackberries, beat up a few starlings and take in a little ice fishing. Smart things! Yeah, lately I’ve been watching decent flocks of Robins (up to about 30 at a time) in the hackberry visible from my front window near Powderhorn Park. It’s rather nice to still hear American Robins calling while you’re shoveling out 17 inches of snow. First, Sharon, how wonderful to have a mother that quoted poetry to you! There are so many mothers who would never think of anything to entertaining and creative! Secondly, since I live in ‘evergreen California’ I do not get the opportunity to experience Winter or Winter’s birds. So it was a joy to read about them from your perspective. Thanks! Great post. Though I think, to some degree, that your weatherman is right. When you see robins “foraging among the green grass” that is a pretty good indication that it is spring. In other words, it’s not the robins’ presence that indicates spring but their behavior. Robins, the iconic bird of spring thaw, ice fishing? Yet another sign of the apocalypse! I love your mother’s poem and your take on the robins. I have seen a few around here too this winter. You have weathermen who know words like “foraging”? Enviable! thoroughly enjoyed this post. In spite of seeing robins year round, they still signal spring when hopping about our lawn. My mom used to recite that poem to me too! I was also dubious about it, because we had a barn and I never saw robins inside. Just Rock Pigeons, House Sparrows, Starlings, Barn Swallows, and once a Screech Owl. I thought I was crazy. 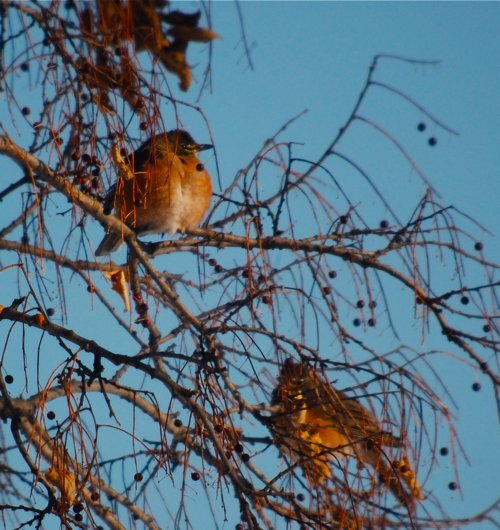 It’s the 6th of January and I have about a dozen Robins in the tree in my backyard. I live in eastern Iowa and you just don’t see them around this time of year. large flock of winter robins running aouund my backyard. My wife didn’t believe me until we looked them up in the computer. So glad to have found this post. I saw about a dozen or so huge, robin-like birds in the trees near my home a few weeks ago and couldn’t imagine what they were. They looked half-again as long and four times as wide as the ones I’m used to seeing on the ground in spring. It was such a bizarre sight that I took pictures so I’d be able to prove it to people later. could this be a different species of robins? Today there appears to be about 30 or more robins eating berries on a couple bushes along the driveway, didnt realize they were winter type birds. maybe spring isnt too far away even though there is a foot of snow on the ground in plymouth,mass ! I am noticing a single robin in my tree here in Southern Ontario, just North and East of Toronto. It doesn’t fly…that I can see. It hops around the branches and nibbles on these blue/grey berries on the tree. I’ve seen it jump into the eave and take a drink. Is there anything I can do to help it through the winter? My hairdresser had 8 robins in her front yard on Christmas Day and my mom saw 4 robins yesterday in her back yard. We live in Eganville, Ontario (about an hour to Ottawa). 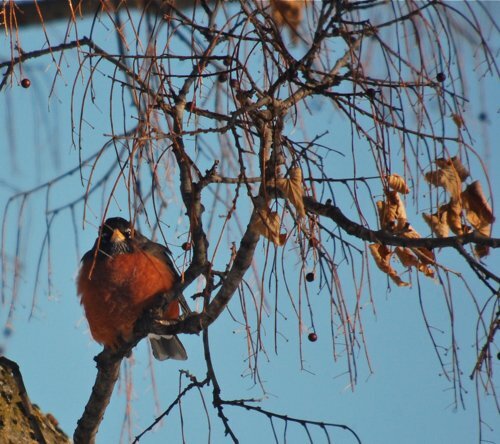 While very unlikely – the sighting of robins bring spring to mind and warms a person up!!!! I used to live in southern AL and actually for us seeing robins did signify spring. They didn’t live in our area at all and only stopped by on their migrations back to the north. I always wondered why we never saw them in the fall on their way down to their wintering grounds. I just counted 15 well fed robins on my snow-covered front lawn eating ornamental pear remnants from our tree in ME. Most of the birds are on the ground picking through the snow, but some are in the tree. I’m a native New Englander and I’ve never saw robins in the dead of winter before. Very cool! We’ve had one Robin coming to our bird feeders all winter this year. It’s the first time I’ve ever seen a Robin in winter. We bought extra mealworms and mixed feed that included dried fruit & nuts. so cool! We live in northern NH in the valley of the White Mts. This is the second year I have had Robins in my yard and tree in NY northwest of Rochester near the Lake. The tree is loaded with berries and the Robins are eating their fill. There were at least 20 Robins in the tree today. Many different varieties too. I saw one that was really big with a design in white on his wings. Just saw a flock of robins in a bush in the backyard. Couldn’t believe my eyes. Lots of them, only landing for a few seconds then flying around the bush. Never have seen this sight before in January..Ajax, Ontario! It is mid February and I have observed flocks of Robins in my back yard. Someone told me they came from Canada. Since I was a young boy I thought Robins were a sign of the arrival of Spring.